My name is Alex, and I am a dessert addict ("Hi, Alex"). I realized that I am an addict because it interferes with my everyday life, pinterest becomes impossible and a tweet even hinting at donuts makes my mouth salivate. See my dilemma? 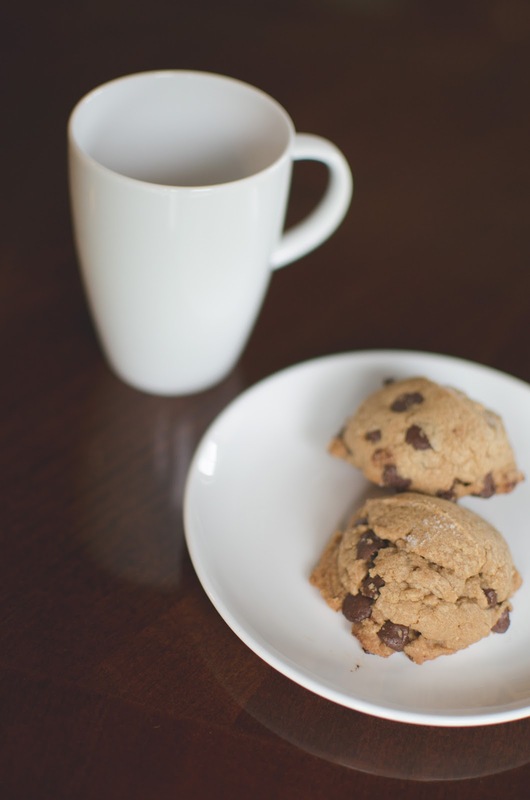 So when my husband mentioned that he could go for a cookie, my mind was set on getting a cookie in my mouth. I began the Pinterest hunt for the perfect recipe. 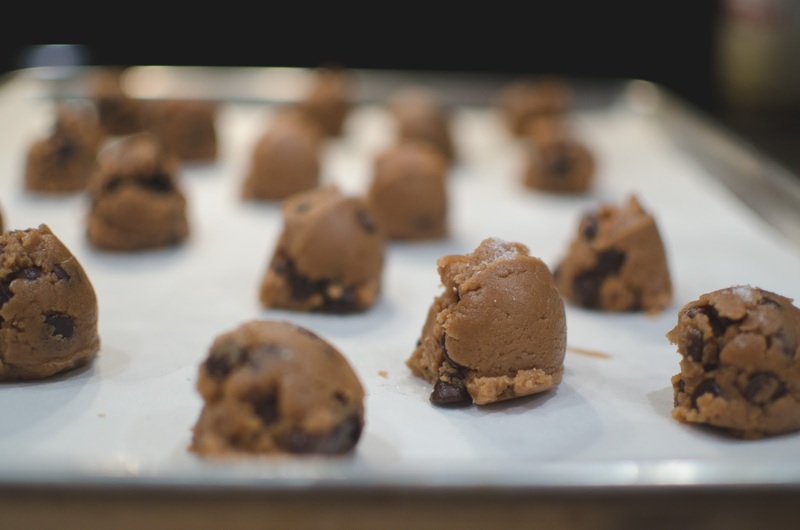 With a peanut butter cookie in mind, I began searching, at the same time that the mister said "Like a big chocolate chip cookie!"... So what did I proceed to do? Mix two recipes! The end result? 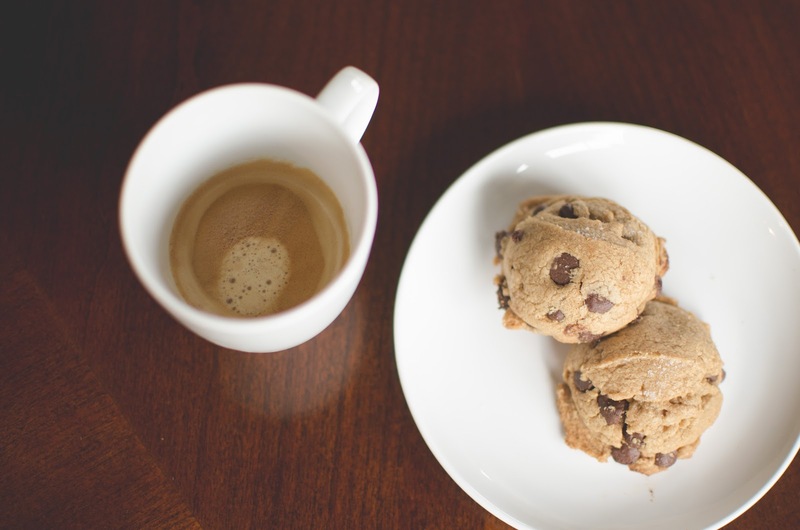 Cookies that lasted no longer than three days, that pair nicely with an espresso. My mind tends to wander, and this might sound crazy, but wouldn't these be delicious if used in smore's? Think about it, instead of using graham crackers and chocolate, use these instead. Mmm! Right, off to go do that before I begin drooling on my key board. Starting with my butter, I melted it in a saucepan until it browned just slightly, then I popped it into the freezer to cool it. Once that is completely cooled I combine that and the sugar in my kitchen aid stand mixer. Continue by adding the egg, your nut butter of choice, I used creamy peanut butter and then the vanilla. Once those are mixed together, I begin to mix in the dry ingredients. Lastly I added the chocolate chips, I used half dark chocolate and half milk chocolate. 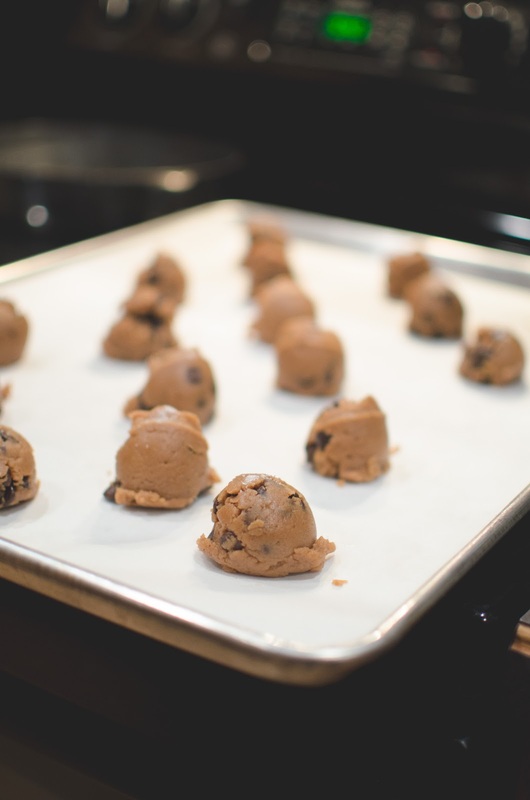 I lined my baking sheet with parchment paper, and using an ice-cream scooper, I placed them one inch from each other. Whilst I was mixing the ingredients together I had my oven preheating to 350 degrees F, and only left them in for 11 minutes. They do not flatten or expand, and my husband said "better gooey than burnt", my thoughts exactly. Perfect late night sized snacks, and oh, what the heck, go ahead and eat them for breakfast too!